What Didn't The Movie BACK TO THE FUTURE 2 PREDICT? What Didn’t The Movie BACK TO THE FUTURE 2 PREDICT? 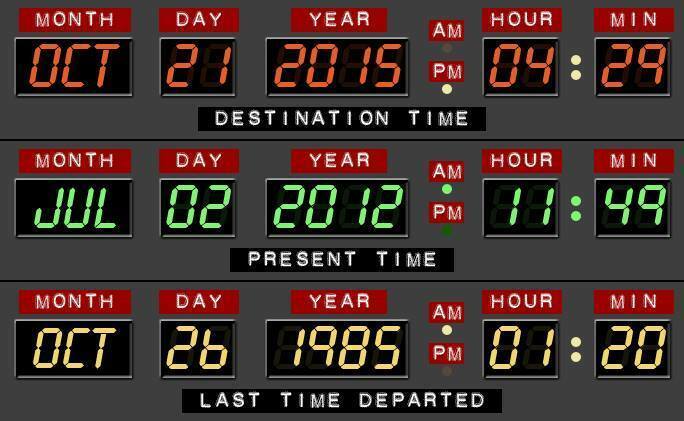 Film fans from all over the world celebrate the October 21 2015 as the Back To The Future Day! The fact that the day from the movie Back To The Future 2 (filmed in 1989), when Marty McFly and Doc arrive in the future has come, is epic! Everybody is talking about it! Today`s video you are about to watch presents several things that this movie predicted almost 30 years ago! We admit, it was quite precise! First up in this list are the hoverboards. They are here! Although they need a bit more tweaks. Next, we have the 3D movies. This is probably the most accurate prediction of all! 3D movies are pretty much all around us! Then, there is the food hydrator which is not quite like the movie creators have imagined. Then, self-tying shoes. We don`t have them yet, but Nike has stated that they are working on it! These shoes are followed by the video chat ability – not only we can chat through the smart TVs, but also we can have the video chat in our hands! Phones in glasses are next, but they were not accepted by the public. The last one is probably the “creepiest”! Back to the Future 2 predicted that the Chicago Cubs won the World Series, and they are on the right way to accomplish that! We just have to wait a little more! Finally, click here to see the first real Hoverboard in action. Of course it is a prototype, but at least it`s real! What do you think?! It’s almost “Back to the Future” day! !